Parenthood is full of uncertainties, but there’s one thing that parents can count on: college tuition is likely to keep rising. To spare themselves and their children from years of loan repayments, parents need to understand the many ways to save for college tuition and to reduce college costs. There are plenty of options for saving beyond the coffee can hidden under the bed: Coverdell Education Savings Accounts (cover K-12 expenses in addition to college, and are limited to $2,000 annual contributions), standard personal savings and investment accounts (generally subject to state and federal income taxes), and 529 plans (college savings plans that are free from federal taxes) are all good options. In honor of College Savings Day on 5/29, we’ll focus this post on 529 plans. Future posts will look at other aspects of paying for college. First, it’s important to know what costs your child will face. Take a deep breath and visit the College Cost Calculator for an estimation based on your child’s age, the type of school s/he will likely attend, and average tuition inflation. 529 plans fall into two categories. The first, a prepaid tuition plan, is currently available in 11 states. It allows parents to buy tuition ahead of time, based on today’s costs. The money is then passed on to the college when the child enrolls down the road. This is a great option for students who know they’re going to stay in-state because it locks them into tuition rates that are almost certain to be lower. The second variety, the savings plan, is a bit more versatile. 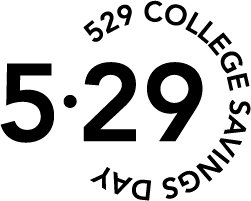 The 529 savings plan works a bit like a 401(k) retirement plan: money contributed into the account is invested, typically in mutual funds (either by a fund manager or by the account holder, depending on the plan), and can later be withdrawn for qualifying education expenses without being subject to federal taxes. While enrolling in your state’s plan may offer you particular benefits, you can enroll in any plan in any state, regardless of where you live or where your child ends up enrolling. Be sure to research all state plans to find the best one for your family. Anyone can contribute to a 529, so spread the word to grandparents, aunts and uncles, etc. Almost all plans allow the account to be transferred to another beneficiary without penalty, so if your child is drafted to the NBA and no longer needs your help paying for college down the line, the account can become his younger sister’s college fund instead. Most financial advisors recommend that parents who can afford only retirement savings or college savings choose the former. Your child can always borrow money for college, but you can’t borrow money for retirement. CollegeSavings.org allows visitors to research their plan options by state or by feature. Consider whether a prepaid tuition or savings plan is best for your family first, and be sure to consider other factors like the minimum initial contribution and maximum total contribution limits; state tax breaks and other state-specific benefits; and enrollment and other annual fees charged by the plan. 529 plans are considered to be assets of the parents, not the student, in calculating Expected Family Contribution for financial aid under the FAFSA form, the universally utilized calculator of college financial aid. This means that it has less of an impact when total family assets are considered. A note about using a 401(k) or IRA retirement account as a college savings fund: Most financial advisors seem to steer people away from this option. Even though account holders can withdraw from these funds without penalties after the age of 59 1/2, the withdrawals still count as taxable income, unlike funds from a 529. Additionally, the amount withdrawn will be added to your annual income, meaning that you will fall into a higher income bracket and your child may not qualify for financial-based student aid next year. Important Note: The information above is intended to get you started thinking about these issues -- not to be financial, investment, or accounting advice. Please see an appropriate professional for specific guidance, tailored to your family's needs.